Taking the first step into the sailing community can sometimes feel more like a giant leap. The Seattle Sailing Club, in conjunction with the American Sailing Association, not only takes the stress out of the journey, it makes it fun. Our experienced instructors are sure to provide you with all the information necessary to succeed in your sailing lessons. They will work at your speed, allowing you to make the most out of every minute you spend on the Puget Sound. We guarantee that you will feel comfortable on the water and have the knowledge to pass the course and receive the American Sailing Association seal of approval. These 15-hour sailing lessons are designed for students who have either never sailed, or have been on the water and are ready to learn more. It is the perfect first step towards becoming a competent sailor. 3 hours in a classroom; 12 hours on-the-water hands-on instruction. Monday and Wednesday from 5:30pm to 9pm (2 consecutive weeks). Tuesday and Thursday from 5:30pm to 9pm (2 consecutive weeks). Q: How can I prepare for my ASA course? Are there any course materials I need before the lesson? Schedule your lesson. Call or email the club to schedule your lesson. Pick up & READ the course materials. Sailing Made Easy by American Sailing Association, ASA Log Book and ASA 101 syllabus are available at Seattle Sailing Club. If you live out of the area, we can ship the materials to you. Note: The course materials are included in the cost of the course, but there is an additional fee to ship them. Check out ASA’s e-course to get started on the basics. Get a head start on the reading. Reading the course text and syllabus will give you an idea of what to expect during the lesson. Pack your bag according to the marine weather forecast. We suggest bringing a waterproof outer shell, warm layers made with polyester, fleece, wool or merino wool (no cotton), non-slip/non-marking shoes, a water bottle, lunch, sunscreen, and chapstick. The National Oceanic and Atmospheric Administration’s (NOAA) website provides up-to-date weather forecasts for the Puget Sound area. At the bottom of the page, you will find the forecast for the Puget Sound and Hood Canal. Q: What is the certification process and how much does it cost? Pass the ASA 101 written certification exam along with the on-the-water skills test (completed during the last day of the lesson). ASA Fees (Completed at Seattle Sailing Club) Our school is an affiliate of the American Sailing Association. The ASA takes the lead on sailing instruction and sailing schools within the United States. SSC’s sailing lessons correspond to ASA’s internationally recognized curriculum to prepare you to take the certification exam. If you choose to get certified (more than 90% of our students do) there are ASA fees in addition to what you paid for the course itself. There is a $39 ASA Student Registration Fee and each certification carries a fee of $30. The certifications are good for life. Upon completing this course you will have the required skills to act as a competent crew on a sailing vessel. While you will not be certified to skipper a boat, you will have the necessary skills to return the boat to shore in the event that something happens to the skipper. Your certification should arrive in the mail within 4 to 6 weeks after passing your certification exam. Get on the water! Join SSC staff and members for one free SSC flotilla or fun race to practice the skills acquired during your lesson. Please call to RSVP for a program. Q: What if I need to cancel or reschedule my lesson? What if Seattle Sailing Club cancels my lesson? Seattle Sailing Club’s first priority is safety. We may postpone or reschedule lessons at our own discretion for unforeseen circumstances or unsafe/extreme weather conditions. Students must give the club at least 7 days notice to cancel or reschedule a lesson for a full refund. A fee of $100 will be charged for cancellations/reschedules made within 7-days of the student’s scheduled lesson. Payment will not be refunded after the first day of the student’s lesson. There are no refunds for missed lessons. Missing a course due to personal illness or family emergencies can be rescheduled by contacting the club. These 21-hour sailing lessons build directly on the skills learned from ASA 101. If your goal is to skipper boats under 30 feet, equipped with an inboard or outboard engine, and tiller driven, look no further. Pick up & READ the course materials. 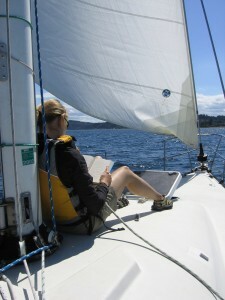 Coastal Cruising Made Easy by American Sailing Association and ASA 103 syllabus are available at Seattle Sailing Club. If you live out of the area, we can ship the materials to you. Note: The course materials are included in the cost of the course, but there is an additional fee to ship them. Pack your bag according to the marine weather forecast. We suggest bringing a waterproof outer shell, warm layers made with polyester, fleece, wool or merino wool (no cotton), non-slip/non-marking shoes, a water bottle, lunch, sunscreen, and chapstick. The National Oceanic and Atmospheric Administration’s(NOAA) website provides up-to-date weather forecasts for the Puget Sound area. At the bottom of the page, you will find the forecast for the Puget Sound and Hood Canal. Pass the ASA 103 written certification exam along with the on-the-water skills test (completed during the last day of the lesson). Pay the $30 ASA certification exam fee. 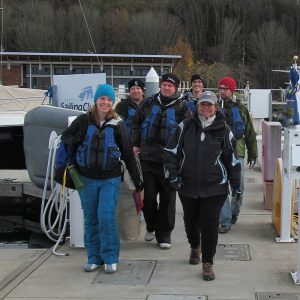 Plan and participate in your class’ 3-hour graduation sail on one of Seattle Sailing Club’s boats under 30ft. The graduation sail gives students the opportunity to use the skills they have acquired from ASA 103 without the guidance of their instructor. Get on the water! After the graduation sail, you have officially completed your certification and are certified to skipper boats from sailing organizations that recognize ASA certifications. 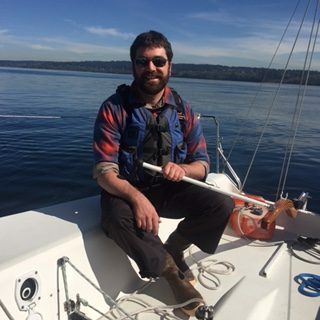 If you’ve joined one of Seattle Sailing Club’s memberships, you are certified to skipper boats under 30ft. Your certification should arrive in the mail within 4 to 6 weeks after completing your grad sail. Enter the big boat world and spend a weekend on a boat 30′-40′ in length with three other students and a certified skipper. In these sailing lessons, you will take the skills from your previous courses and apply them to a larger boat. Additionally, you will learn how to troubleshoot common diesel engine problems, preparing you for a trip of your own day sails or overnight charters. Schedule your lesson. Call or email the club to schedule your lesson. While scheduling this lesson, please make sure to notify SSC of any dietary restrictions or food allergies. Pick up & READ the course materials. 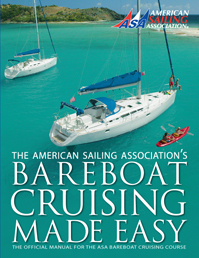 Bareboat Cruising Made Easy and ASA 104 syllabus are available at Seattle Sailing Club. If you live out of the area, we can ship the materials to you. Note: The course materials are included in the cost of the course, but there is an additional fee to ship them. Get a head start on the reading. Reading over the course text and syllabus will give you an idea of what to expect during the lesson. Pass the ASA 104 written certification exam along with the on-the-water skills test (completed during the last day of the lesson). Get on the water! After passing your ASA 104 exam, you have officially completed your certification. You are now certified to skipper monohulls up to 50ft from sailing organizations around the world that recognize ASA certifications. If you’ve joined one of Seattle Sailing Club’s memberships, you are now certified to skipper boats up to 50ft. Your certification should arrive in the mail within 4 to 6 weeks after passing the exam. For more information on ASA’s International Proficiency Certification, click here. Spend 5 days & 4 nights out on the water getting certified for ASA 103 Basic Coastal Cruising + ASA 104 Bareboat charter. These sailing lessons will follow the same topics as the ASA 103 + ASA 104. Schedule your sailing lesson. Call or email the club to schedule your lesson. While scheduling this lesson, please make sure to notify SSC of any dietary restrictions or food allergies. Pick up & READ the course materials. 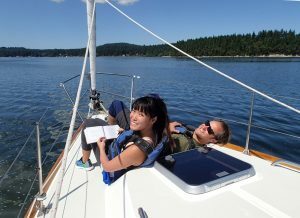 Coastal Cruising Made Easy by American Sailing Association and ASA 103 syllabus + Bareboat Cruising Made Easy and ASA 104 syllabus are available at Seattle Sailing Club. If you live out of the area, we can ship the materials to you. Note: The course materials are included in the cost of the course, but there is an additional fee to ship them. Pass the ASA 103 + 104 written certification exam along with the on-the-water skills test (completed during the last day of the lesson). Pay the $30 ASA certification exam fee (1 fee for each certification, this course has 2 certifications). Get on the water! After passing your ASA 103 + 104 exams, you have officially completed your certification. You are now certified to skipper monohulls up to 50ft from sailing organizations around the world that recognize ASA certifications. If you’ve joined one of Seattle Sailing Club’s memberships, you are now certified to skipper boats up to 50ft. Your certification should arrive in the mail within 4 to 6 weeks after passing the exam. For more information on ASA’s International Proficiency Certification, click here. This 15-hour, classroom based sailing lesson teaches navigation by chart using navigational tools and publications. Schedule your sailing lesson. Call or email the club to schedule your lesson. Pick up & READ the course materials. Coastal Navigation workbook with DVD by Capt. 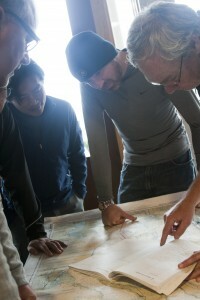 Mike Pyzel, training chart 1210TR, and ASA 105 syllabus are available at Seattle Sailing Club. If you live out of the area, we can ship the materials to you. Note: The course materials are included in the cost of the course, but there is an additional fee to ship them. Purchase additional navigation tools such as a parallel ruler, divider, #2 pencils, small digital calculator, and an eraser. Pass the ASA 105 written certification exam. Get on the water! After passing your ASA 105 exam, you have officially completed your certification. This course has provided you with the tools and techniques to navigate safely in coastal and inland waters. You are now ready to take ASA 106: Advanced Coastal Cruising. Your certification should arrive in the mail within 4 to 6 weeks after passing the exam.